Common side effects, which often occur within two hours of the medication being given, include rash, itchiness, low blood pressure, and shortness of breath. Other severe side effects include reactivation of hepatitis B in those previously infected, progressive multifocal leukoencephalopathy, and toxic epidermal necrolysis. It is unclear if use during pregnancy is safe for the baby. Rituximab is a chimeric monoclonal antibody against the protein CD20, which is primarily found on the surface of immune system B cells. 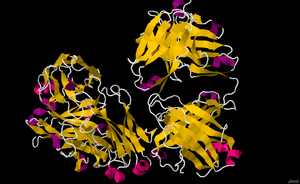 When it binds to this protein it triggers cell death. Rituximab was approved for medical use in 1997. It is on the World Health Organization's List of Essential Medicines, the most effective and safe medicines needed in a health system. The wholesale price in the developing world as of 2014 was US$148–496 per 100 mg. In the United Kingdom this amount cost the NHS approximately £182 in 2015. The average wholesale price in the United States of a typical treatment for rheumatoid arthritis (1,000 mg IV dose, 2 weeks apart) would have been $14,100 a month in 2014 ($705 per 100 mg) but the patent expired in 2016. A number of biosimilars have been launched. Rituximab destroys both normal and malignant B cells that have CD20 on their surfaces and is therefore used to treat diseases which are characterized by having too many B cells, overactive B cells, or dysfunctional B cells. Rituximab is used to treat cancers of the white blood system such as leukemias and lymphomas, including non-Hodgkin's lymphoma and lymphocyte predominant subtype, of Hodgkin's Lymphoma. This also includes Waldenström's macroglobulinemia a type of NHL. Other autoimmune diseases that have been treated with rituximab include autoimmune hemolytic anemia, pure red cell aplasia, thrombotic thrombocytopenic purpura (TTP), idiopathic thrombocytopenic purpura (ITP), Evans syndrome, vasculitis (e.g., granulomatosis with polyangiitis), bullous skin disorders (for example pemphigus, pemphigoid—with very encouraging results of approximately 85% rapid recovery in pemphigus, according to a 2006 study), type 1 diabetes mellitus, Sjogren's syndrome, anti-NMDA receptor encephalitis and Devic's disease, Graves' ophthalmopathy, autoimmune pancreatitis, Opsoclonus myoclonus syndrome (OMS), and IgG4-related disease. There is some evidence that it is ineffective in treating IgA-mediated autoimmune diseases. Rituximab mechanisms of action; the three major independent mechanisms are (1) antibody dependent cellular cytotoxicity (ADCC), (2) complement mediated cytotoxicity (CMC), and (3) apoptosis; subset panel illustrates a schematic view of CD20 structure and rituximab. The antibody binds to the cell surface protein CD20. CD20 is widely expressed on B cells, from early pre-B cells to later in differentiation, but it is absent on terminally differentiated plasma cells. CD20 does not shed, modulate or internalise. Although the function of CD20 is unknown, it may play a role in Ca2+ influx across plasma membranes, maintaining intracellular Ca2+ concentration and allowing activation of B cells. Rituximab tends to stick to one side of B cells, where CD20 is, forming a cap and drawing proteins over to that side. The presence of the cap changes the effectiveness of natural killer (NK) cells in destroying these B cells. When an NK cell latched onto the cap, it had an 80% success rate at killing the cell. In contrast, when the B cell lacked this asymmetric protein cluster, it was killed only 40% of the time. Rituximab was developed by researcher Nabil Hanna and coworkers at IDEC Pharmaceuticals under the name IDEC-C2B8. The U.S. patent for the drug was issued in 1998 and expired in 2015. Rituximab is currently co-marketed by Biogen and Genentech in the U.S., by Hoffmann–La Roche in Canada and the European Union, Chugai Pharmaceuticals, Zenyaku Kogyo in Japan and AryoGen in Iran. In 2014 Genentech reclassified rituxan as a specialty drug, a class of drugs that are only available through specialty distributors in the US. Because wholesalers discounts and rebates no longer apply, hospitals would pay more. Originally available for intravenous injection (e.g. over 2.5 hrs), in 2016 it gained EU approval in a formulation for subcutaneous injection for CLL. Patents on the drug in expired in Europe in February 2013 and in the US in September 2016. By November 2018[update], several biosimilars had been approved across India, the European Union, Switzerland, Japan and Australia. Rituximab did not improve symptoms in patients with chronic fatigue syndrome in a trial published in 2019. 22% of participants had serious events. This potential use was investigated after improvements in chronic fatigue syndrome was seen in two cancer patients treated with rituximab. For CNS diseases, rituximab could be administered intrathecally and this possibility is under study. ^ a b c d e f g h "Rituximab". The American Society of Health-System Pharmacists. Archived from the original on 27 March 2016. Retrieved 8 December 2016. ^ Tandan, Rup; Hehir, Michael K.; Waheed, Waqar; Howard, Diantha B. (August 2017). "Rituximab treatment of myasthenia gravis: A systematic review". Muscle & Nerve. 56 (2): 185–196. doi:10.1002/mus.25597. ISSN 1097-4598. PMID 28164324. ^ Singer, O; McCune, WJ (May 2017). "Update on maintenance therapy for granulomatosis with polyangiitis and microscopic polyangiitis". Current Opinion in Rheumatology. 29 (3): 248–253. doi:10.1097/BOR.0000000000000382. PMID 28306595. ^ a b Bosch, Xavier; Ramos-Casals, Manuel; Khamashta, Munther A. (2013). Drugs Targeting B-Cells in Autoimmune Diseases. Springer Science & Business Media. pp. 1–4. ISBN 9783034807067. Archived from the original on 2017-11-05. ^ British national formulary : BNF 69 (69 ed.). British Medical Association. 2015. p. 638. ISBN 9780857111562. ^ a b "Rituximab Biosimilars Shown to Be Safe and Effective". www.medscape.com. Archived from the original on 15 March 2018. Retrieved 29 November 2017. ^ Saini KS, Azim HA Jr, Cocorocchio E, Vanazzi A, Saini ML, Raviele PR, Pruneri G, Peccatori FA (2011). "Rituximab in Hodgkin lymphoma: Is the target always a hit?". Cancer Treat Rev. 37 (5): 385–90. doi:10.1016/j.ctrv.2010.11.005. PMID 21183282. ^ Edwards J, Szczepanski L, Szechinski J, Filipowicz-Sosnowska A, Emery P, Close D, Stevens R, Shaw T (2004). "Efficacy of B-cell-targeted therapy with rituximab in patients with rheumatoid arthritis" (PDF). N Engl J Med. 350 (25): 2572–81. doi:10.1056/NEJMoa032534. PMID 15201414. ^ Tak PP, Kalden JR (2011). "Advances in rheumatology: new targeted therapeutics". Arthritis Research & Therapy. 13 (Suppl 1): S5. doi:10.1186/1478-6354-13-S1-S5 (inactive 2019-02-08). PMC 3123966. PMID 21624184. ^ McGinley, MP; Moss, BP; Cohen, JA (January 2017). "Safety of monoclonal antibodies for the treatment of multiple sclerosis". Expert Opinion on Drug Safety. 16 (1): 89–100. doi:10.1080/14740338.2017.1250881. PMID 27756172. ^ a b Paul, Marla (May 20, 2009). "Popular Cancer Drug Linked to Often Fatal 'Brain Eating' Virus". Northwestern University News and Information. Archived from the original on May 29, 2010. Retrieved 2009-05-22. ^ "Press Announcements". Journal of Polymer Science B Polymer Physics. 8 (10): 1845. 1970. Bibcode:1970JPoSB...8.1845.. doi:10.1002/pol.1970.160081020. Archived from the original on 2009-05-13. Retrieved 2013-04-29. ^ Froissart A, Veyradier A, Hié M, Benhamou Y, Coppo P (August 2015). "Rituximab in autoimmune thrombotic thrombocytopenic purpura: A success story". Eur J Intern Med. 26 (9): 659–65. doi:10.1016/j.ejim.2015.07.021. PMID 26293834. ^ A. Razzaque Ahmed, M.D. ; Zachary Spigelman, M.D. ; Lisa A. Cavacini, Ph.D.; Marshall R. Posner, M.D. (October 26, 2006). "Treatment of Pemphigus Vulgaris with Rituximab and Intravenous Immune Globulin". N Engl J Med. 355 (17): 1772–1779. doi:10.1056/nejmoa062930. PMID 17065638. ^ Jacob A, Weinshenker BG, Violich I, McLinskey N, Krupp L, Fox RJ, Wingerchuk DM, Boggild M, Constantinescu CS, Miller A, De Angelis T, Matiello M, Cree BA (2008). "Treatment of neuromyelitis optica with rituximab: retrospective analysis of 25 patients". Arch Neurol. 65 (11): 1443–1448. doi:10.1001/archneur.65.11.noc80069. PMID 18779415. Archived from the original on 2009-03-04. ^ "Rituximab Treatment of Patients with Severe, Corticosteroid-Resistant Thyroid-Associated Ophthalmopathy". Archived from the original on 2017-08-22. Retrieved 2011-10-19. ^ "Immunomodulators and Rituximab in the Management of Autoimmune Pancreatitis". doi:10.3998/panc.2013.20. Archived from the original on 2014-05-02. Retrieved 2014-04-30. ^ Pranzatelli, M. R. (2004). "Immunologic and Clinical Responses to Rituximab in a Child with Opsoclonus-Myoclonus Syndrome". Pediatrics. 115 (1): e115–9. doi:10.1542/peds.2004-0845. PMID 15601813. ^ Khosroshahi, A.; Wallace, Z. S.; Crowe, J. L.; Akamizu, T.; Azumi, A.; Carruthers, M. N.; Chari, S. T.; Della-Torre, E.; Frulloni, L.; Goto, H.; Hart, P. A.; Kamisawa, T.; Kawa, S.; Kawano, M.; Kim, M. H.; Kodama, Y.; Kubota, K.; Lerch, M. M.; Löhr, M.; Masaki, Y.; Matsui, S.; Mimori, T.; Nakamura, S.; Nakazawa, T.; Ohara, H.; Okazaki, K.; Ryu, J.H. ; Saeki, T.; Schleinitz, N.; et al. (2015). "International Consensus Guidance Statement on the Management and Treatment of IgG4-Related Disease". Arthritis & Rheumatology. 67 (7): 1688–1699. doi:10.1002/art.39132. PMID 25809420. ^ He Y, Shimoda M, Ono Y, Villalobos IB, Mitra A, Konia T, Grando SA, Zone JJ, Maverakis E (2015). "Persistence of Autoreactive IgA-Secreting B Cells Despite Multiple Immunosuppressive Medications Including Rituximab". JAMA Dermatol. 151 (6): 646–50. doi:10.1001/jamadermatol.2015.59. PMID 25901938. ^ "Genentech: Products - Product Information - Immunology - Rituxan RA Full Prescribing Information". Archived from the original on 2007-12-13. Retrieved 2007-12-03. ^ Molloy, Eamonn S.; Calabrese, Leonard H. (2012). "Progressive multifocal leukoencephalopathy associated with immunosuppressive therapy in rheumatic diseases: Evolving role of biologic therapies". Arthritis & Rheumatism. 64 (9): 3043–3051. doi:10.1002/art.34468. PMID 22422012. ^ Burton C, Kaczmarski R, Jan-Mohamed R (2003). "Interstitial pneumonitis related to rituximab therapy". N Engl J Med. 348 (26): 2690–1, discussion 2690–1. doi:10.1056/NEJM200306263482619. PMID 12826649. ^ "Reports of Bowel Obstruction and Perforation with RITUXAN (rituximab)" (PDF). Roche Canada. 2006-11-10. Archived (PDF) from the original on 2014-03-27. ^ "Rituximab (marketed as Rituxan) Information". Archived from the original on 15 November 2009. Retrieved 15 November 2009. ^ "Rituximab, RA and PML" (PDF). Archived (PDF) from the original on 2008-09-16. Retrieved 2008-09-14. ^ Kriston, Levente (2009). "Challenges in Reporting Meta-analyses of Diagnostic Accuracy Studies". Annals of Internal Medicine. 150 (6): 430. doi:10.7326/0003-4819-150-6-200903170-00025. ^ Seyfizadeh, Narges; Seyfizadeh, Nayer; Hasenkamp, J; Huerta-Yepez, S (2016). "A molecular perspective on rituximab: A monoclonal antibody for B cell non Hodgkin lymphoma and other affections". Crit Rev Oncol Hematol. 97: 275–290. doi:10.1016/j.critrevonc.2015.09.001. PMID 26443686. ^ Rudnicka, D.; Oszmiana, A.; Finch, D. K.; Strickland, I.; Schofield, D. J.; Lowe, D. C.; Sleeman, M. A.; Davis, D. M. (2013). "Scientists discover why a specific cancer drug is so effective". Blood. 121 (23): 4694–4702. doi:10.1182/blood-2013-02-482570. PMID 23613524. Archived from the original on 2013-05-03. Retrieved 2013-04-29. ^ Rudnicka, D.; Oszmiana, A.; Finch, D. K.; Strickland, I.; Schofield, D. J.; Lowe, D. C.; Sleeman, M. A.; Davis, D. M. (2013). "Rituximab causes a polarization of B cells that augments its therapeutic function in NK-cell-mediated antibody-dependent cellular cytotoxicity". Blood. 121 (23): 4694–4702. doi:10.1182/blood-2013-02-482570. PMID 23613524. ^ Shaw, T. (2003). "B cell therapy for rheumatoid arthritis: The rituximab (anti-CD20) experience". Annals of the Rheumatic Diseases. 62 (90002): 55ii–59. doi:10.1136/ard.62.suppl_2.ii55. PMC 1766758. PMID 14532151. ^ Maloney DG, Grillo-López AJ, White CA, et al. (September 1997). "IDEC-C2B8 (Rituximab) anti-CD20 monoclonal antibody therapy in patients with relapsed low-grade non-Hodgkin's lymphoma". Blood. 90 (6): 2188–95. PMID 9310469. ^ Scott, Shane D. (1998). "Rituximab: A New Therapeutic Monoclonal Antibody for Non-Hodgkin's Lymphoma". Cancer Practice. 6 (3): 195–197. doi:10.1046/j.1523-5394.1998.006003195.x. ^ "Roche Gets EC Nod for Follicular Lymphoma Maintenance Therapy". October 29, 2010. Archived from the original on October 31, 2010. ^ "www.who.int" (PDF). Archived (PDF) from the original on 2015-05-13. ^ a b Saporito, Bill (27 October 2014). "Hospitals Furious at Cancer-Drug Price Hikes". Time. Archived from the original on 20 October 2015. Retrieved 26 October 2015. ^ "EU approves second indication for subcutaneous form of Roche's rituximab". Archived from the original on 2016-06-07. Retrieved 2016-06-09. ^ a b "Biosimilars of Rituximab". Generics and Biosimilars Initiative. 14 April 2017. Archived from the original on 2017-03-31. Retrieved 2017-04-29. ^ Lahiri, Diptendu; Osterman, Cynthia (2 November 2018). "Novartis abandons effort for U.S. approval of biosimilar rituximab". Reuters. Retrieved 3 November 2018. ^ a b Fluge, Øystein; Rekeland, Ingrid G.; Lien, Katarina; Thürmer, Hanne; Borchgrevink, Petter C.; Schäfer, Christoph; Sørland, Kari; Aßmus, Jörg; Ktoridou-Valen, Irini (2019-04-02). "B-Lymphocyte Depletion in Patients With Myalgic Encephalomyelitis/Chronic Fatigue Syndrome: A Randomized, Double-Blind, Placebo-Controlled Trial". Annals of Internal Medicine. doi:10.7326/M18-1451. ISSN 0003-4819. ^ Castro-Marrero, Jesus; Sáez-Francàs, Naia; Santillo, Dafna; Alegre, Jose (2017). "Treatment and management of chronic fatigue syndrome/myalgic encephalomyelitis: All roads lead to Rome". British Journal of Pharmacology. 174 (5): 345–369. doi:10.1111/bph.13702. PMC 5301046. PMID 28052319. ^ Bonnan, M; Ferrari, S; Bertandeau, E; Demasles, S; Krim, E; Miquel, M; Barroso, B (2014). "Intrathecal rituximab therapy in multiple sclerosis: review of evidence supporting the need for future trials". Current Drug Targets. 15 (13): 1205–14. doi:10.2174/1389450115666141029234644. PMID 25355180. ^ "Fc-structure". Archived from the original on 2007-11-10. Retrieved 2007-12-03. ^ Eccles, SA (2001). "Monoclonal antibodies targeting cancer: 'magic bullets' or just the trigger?". Breast Cancer Research : BCR. 3 (2): 86–90. doi:10.1186/bcr276. PMC 138676. PMID 11250751.